We introduced you to the CLEANLOGIC line with this one and this next one I tried from the line has me so giddy to share with you! It’s their Soap + Sponge ($3.99/4.2oz @ walgreens.com) and it’s exactly what the name says – soap in a sponge. This seems like such an obvious one, right? We are fans of conquering a few things at one time and in this case, it’s washing and exfoliating and the price on this is right on! Available in three scents: Peach Berry (my favorite), Cucumber Melon and Lavender. At this point I’ve used the Peach Berry one a few times and now it looks like a rectangle piece of watermelon without the seeds. Yum! 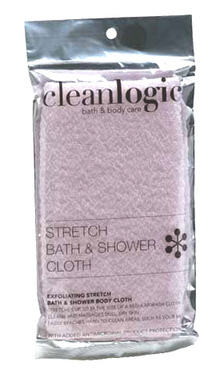 It’s not often that I come up against a product I am kind of but that was the case when I first touched CLEAN LOGIC’s Stretch Bath & Shower Cloth ($6.99 @ ulta.com, amazon.com). It’s coarse, man! But the roughness seems to soften a little when the water hits it, but not too much, which is good. I also like that as the name states, it’s stretchy so I can apply some liquid soap and get my whole back area. I’ve been trying to find an alternative to those gauze shower puffs as I heard they can harbor mucho bacteria. So this is getting me on my way. Choose from four colors.